About the Author: Louis Conte is a polygraph examiner, writer, retired law enforcement officer and independent investigator. As a leading advocate for people with autism, he has championed their cause in state capitols and Washington, DC. He was the lead investigator for and co-author of a seminal paper on the autism-vaccine controversy, Unanswered Questions from the Vaccine Injury Compensation Program: A Review of Compensated Cases of Vaccine-Induced Brain Injury, in the Pace Environmental Law Review, which found that the National Vaccine Injury Compensation Program compensated many children with autism while publicly declaring that vaccines do not cause autism. He is the author of a novel, The Autism War and co-author with Tony Lyons of a work of non-fiction, non-fiction work, Vaccine Injuries: Documented Adverse Reactions to Vaccines, both published by Skyhorse. Sign up for free news and updates from Robert F. Kennedy, Jr. and Children’s Health Defense. 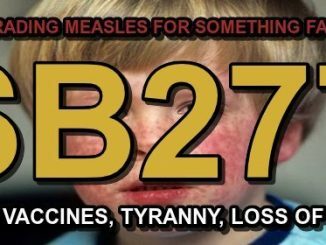 SHUN SB277, EMBRACE CIVIL DISOBEDIENCE & NATURAL IMMUNITY!